I know, I know. 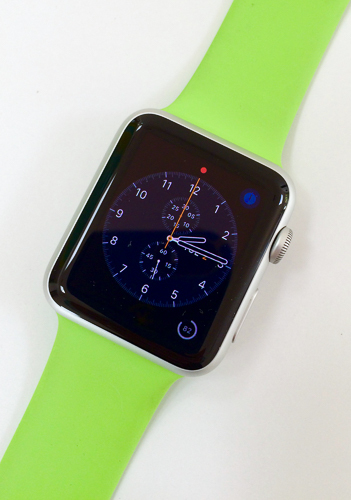 You’ve already read plenty about the Apple Watch. That’s fine. I know I’m not the first to tell you about it. These are my first impressions. There are things that I really like. And there are definitely things that confirm it as a v1.0 device. 1. Feels like iPad 1.0. By this I mean that the Apple Watch is an interesting toe in the water of a new (ok, newish) product category. But definitely not fully realized. In the case of the Watch, it is so reminiscent of the original iPad. Cool new thing. Directionally interesting. But clearly not the device you’re going to be happy living with in the long run. Many of the issues/limitations are the same. Big, boxy, heavy, under powered. Certainly on a different scale. But for each category, true. To be clear, I’m not criticizing. While “good is the enemy of great”*, great is the enemy of shipping. As a product guy, I am a big fan of shipping. So, for Apple Watch v2, given the design ethos of Apple, I’d expect thinner, same barely adequate battery life, more powerful/capable. I have no inside info. Just observing what they’ve done over generations of iPhones and iPads. * Here we are in an Apple focused post. You thought that quote was going to get attributed to Steve Jobs. Nope: Voltaire. 2. Fitness tracking feels pretty inaccurate. This is definitely not unique to the Apple Watch. And I’m not saying that it can’t count steps correctly. I wore a Jawbone Up for a year and found the same thing. Maybe if I was a runner I’d think it was more on the mark. But I’m not. I do Pilates. I do a little weight work. I swim. When all else fails, the elliptical. The Jawbone was completely baffled by pretty much everything except the elliptical and walking the dog. So on days when I had a hard workout at the gym it would tell me to move more. On days when I just took the dog for a long walk, it would celebrate. Umm, no. The Watch came way later than the Up, Nike Fuelband, Fitbit, etc. So there’s been time for the underlying sensors and interpretation of the data to get much better. I think the watch is better. But it is still far from what I’d consider accurate for what I do. Your mileage will definitely vary based on what you do. How about adding Fitness programs for Pilates, aerobics, strength training, …? 3. Heart rate monitoring is about as accurate as other wrist based monitors. Which is to say, kinda sorta accurate. Get a chest strap if you want better accuracy. 4. Isn’t it supposed to be monitoring me? Sheesh. This is one of the most annoying “features” of the watch. It does some amount of activity tracking all the time. But if you want it to track your workouts, you have to remember to start the “Fitness” app. Invariably, I remember this halfway through a walk of part of the way in on the elliptical. Why do I have to monitor it? Why do I have to remember? Since it can tell there’s activity going on, how about *at least* asking me “hey, want to start a workout now?” Or better yet, just start it and get out of the way. Maybe I got used to the ‘always on’ tracking of Jawbone UP/Nike Fuelband/Fitbit, but it is downright weird that you have to remember to start the fitness tracking app. 5. Battery makes it trough the day! Unlike the iPhone, the battery definitely lasts for the whole day and then some. That is good. But honestly, if it can’t last longer or can’t charge more quickly, you lose some of the benefit. Sleep tracking? Nope, it’s on the charger. Alarm clock to wake up? Nope, it’s on the charger. 6. It is odd that you can’t manage apps from the watch itself. I get that the screen is small. That browsing the app store for new apps on the watch might be impractical. But how about at least being able to delete an app from the watch directly. You know, by pressing and holding and pressing the X, like on an iPhone/iPad. 7. It is not waterproof. I don’t need it to be a dive watch. I don’t need it to figure out my decompression schedule. But you can’t take it swimming? Unlike say, a $14 Casio? And honestly, a little watch app that counted and timed laps? That would be pretty nice. 8. The sport band is really nice. Beyond being a lovely green color, it’s very comfortable. Soft and easy to get on and off. 9. The wrist tap is better than you think. The watch is good at notifications. The little tap on the wrist is subtle enough that only you will know about it, but “there” enough that you’ll definitely *know* about it. This, coupled with apps that understand subtlety is the killer app for the Watch. So if you’re trying to stand up more during the day, the watch will remind you to do that in a pretty unintrusive way. Ditto for drinking more water. Or just plain working your todo list. Paired with an app like Timeful, it is powerful. Subtlety is a big deal, one that most app designers haven’t gotten yet. The question shouldn’t be “how do I move my iPhone app to the watch.” It should be how do I enable a different use pattern that is uniquely enabled by the presence on the wrist. I think Marco Arment figured this out for Overcast after first trying to do a lot in the app. And being frustrated by the limitations of the WatchKit development environment. But as with many things, limitations sometimes lead you to a better design. And apps on the watch are definitely a case of Less is More. You want a nudge delivered at the point it would be useful. The watch can do that. And it can do it better than your phone buzzing in your pocket, prompting you to get it out, unlock it and interact with it. There’s just less friction with the watch. So, a couple of weeks in I like the Watch. And I expect I’ll like watch 2.o even more.